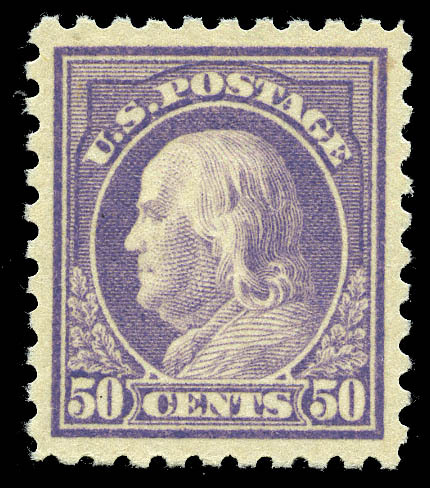 1917, 50¢ light violet (477), original gum never hinged, perfectly centered with lovely fresh color. Superb. SMQ $17,500. A MAGNIFICENT MINT EXAMPLE OF THIS DIFFICULT 50¢ PERF 10 1917, WHICH SO RARELY IS OFFERED IN PRIME MINT CONDITION. THIS IS THE HIGHEST GRADED AND SHARES THIS DISTINCTION WITH ONLY TWO OTHERS. Expertization: with 1986 P.F. certificate "Genuine", implying never hinged and 2018 PSE certificate, latter graded SUP 98.